Lilium canadense. Many flowers contain subtle design techniques to help insure their survival. However, little is subtle about the Canada Lily, both in the ways it attracts pollinators and the method it uses to protect what those visitors want. The bell-shaped flowers, up to 16 of them blooming on a single plant, are bright yellow, orange or red. Both color and a sweet scent attract a variety of insects, but especially butterflies like the Great Spangled Fritillary, which love its nectar and transfer its sticky pollen during visits. The shape and color - especially redder versions like the one here - also attract Ruby-throated Hummingbirds. To keep the nectar and pollen safe, the Canada Lily also evolved its downward-facing flower, with a tightly sealed and shiny surface at the top of the “bell.” Rain rolls off the blossom like an umbrella. 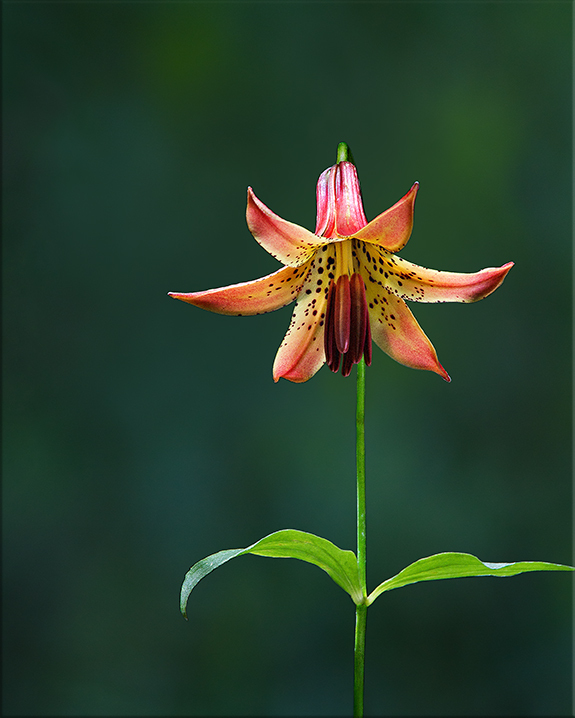 A native of eastern North America - not just Canada, where it was probably first identified - Lilium canadense blooms in mid-summer, favoring partial sunlight of wetlands, including meadows and fields. Once common, it is becoming harder to find in many parts of its range because of overpopulating deer, which often eat the young shoots after they emerge from the ground. In Canada, it is on an endangered species list. American Indians employed the plant both as a medicine and food, using the root for a tea that treated stomach ailments, rheumatism and other problems, and grinding the bulbs to create flour that would thicken soups.